His former Red teammates remembered Pinson’s abilities. Pitcher Jim Brosnan: “I had a shutout going in the eighth inning against the Chicago Cubs. There were two outs and Ernie Banks hit a ball to what was the deepest part of old Crosley Field, out there in right-center field where the flag pole was next to the light tower. Earl Lawson, a Reds reporter for the Cincinnati Post: “I always felt Vada had more talent in his little finger than most guys have in their whole body. Vada could run and he had surprising power. I don’t recall anybody getting to 1,500 hits faster than Vada did. 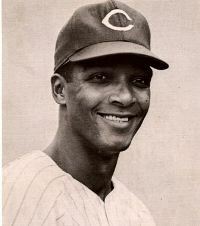 At the time of his death, Pinson ranked among the Reds’ all-time leaders in a stack of offensive categories: hits (fifth, 1,881), doubles (fourth, 342), triples (third, 96), runs (fifth, 978), stolen bases (fifth, 221) at-bats (fifth, 6,335) and games (fifth, 1,565). Former Reds manager Sparky Anderson, recalling his hitting coach with the Detroit Tigers from 1985 to 1991: “He’s one of those guys who came up in the deal of the cards from the bottom of the deck. Vada never got the recognition, he never got any recognition at all. But not one time did I ever hear Vada badmouth anybody about it. He never said a bad word about it. . . . He would spit shine those shoes of his every day. And he was one of the nicest men I’ve ever known. I never heard Vada Pinson bad-mouth anyone. “He looked like his feet never touched the ground. He was so fast, had so many doubles, all his numbers, 2,800 hits, he was such a player. And a gentleman. If there is one word I’d use to describe him, it’s that: He was a gentleman. “Vada never got near the recognition he deserved. Whether it was from being on the same team as Robby and Big Klu (Ted Kluszewski), I don’t know. Pinson’s Reds teammate, Frank Robinson, also attended McClymonds High and was almost exactly three years older than Pinson. Robby said: “The numbers don’t tell the true story. Vada was underrated and underappreciated as a player. He brought a whole lot more to the game than just cold numbers. “He was the first guy I saw who consistently put pressure on outfielders with his speed. Not just with balls he hit into the gaps. He’d hit ground balls to straightaway center and turn them into doubles. Vada was one of the very best ballplayers I ever saw. He was a five tool player before the term became popular. He seemed to glide effortlessly across the outfield. Vada never received the recognition he deserved when he played, after he retired, or most sad of all, after his death. I’m grateful that I grew up watching him. Vada Pinson was a gentleman. He is deserving of inclusion in Cooperstown for his many abilities as a player and for his character. Vada was my hero as a young kid in the 60’s. I wish that there was more video of him to show how great it was to watch him play. As a 58 year old man, now, I’ve never found another player that drew me to them like he did. As I read about comments about his character from people that knew him personally, I know that my instincts were right in following his career. When the Reds traded him, it broke my hurt, but I followed him to the end. So sad he didn’t live longer than I am now. RIP Vada, and thank you for the joy. Vada had a distinct “loping” style as he patroled center field in Crosley Field during the 1960s. I can still recall his slashing line drives, how quickly he got down the line and how swiftly he went from first to third. Clearly, Vada was a man of grace both on and off the field. 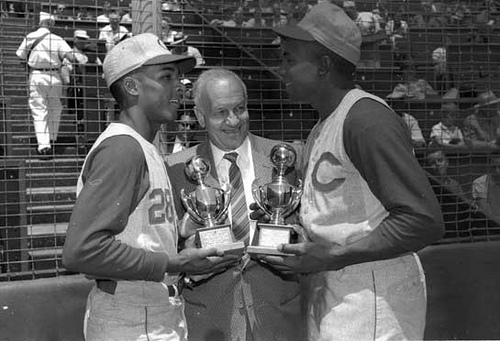 In 1961, Vada Pinson and Frank Robinson transformed what would have been a 5th place team into National League champs. Rest in peace Vada. I have seen many hundreds of major league games in my 60 years. Vada was a tremendous player who needed only to walk a little more and bunt a little more and our discussions about his HOF enshrinement would be moot. Vada himself stated that the worst thing that ever happened to him was hitting a grand slam homer when he first came up. He saw clearly that the big boppers made the dough. When you consider the quality of outfielders in their prime during his playing days, he was second to none except maybe Mays in all around skill. One of the most overlooked players in history. I would put him in if I had the power. He belongs with the other greats of his era. In the 1960’s, as a child, I was a huge baseball fan and could name every starting player on every team and most of the reserves. I was a Pirates fan, but when we played ball on the playground and imitated our favorite players I was always Vada Pinson. His speed and fielding especially captured my imagination but he was an all-around great baseball player. My favorite player as a child and so my favorite player forever. Nowadays they’d be showing his web gems on tv every nite. He was clocked in 3.3 seconds from home to first base. No one in baseball history has more career doubles, triples and HRs than Vada, except Willie Mays. As graceful a player as I ever saw, in CF, running the bases, and swinging a bat. Wish I had tape of him and his pal, Frank Robinson, playing in the OF together. Please get your information correct my father was not lying on the floor for 3 days he had a stroke and we found him in his bed, I have learned since my father dided that the media will do anything to write a story and I no longer read newspapers because I would have to wonder what the hell is the truth. This message to Vada Pinson III. I had the honor of meeting your father, as I was a classmate of your sister’s at Bishop O ‘Dowd. Your father was a gentleman and a scholar, and I admired him. Don’t let the rumors get you down. You know the truth, stand strong. my favorite player.I have my personal Vada Pinson card collection and treasure it to this day.I was shocked and saddened when I learned of his death.He is surely in the Baseball Hall of Fame in Heaven.He is dearly missed. I would always act like Vada Pinson by putting the bat on my shoulder has he did standing at the plate in little league. Move it thur the stike zone and move my head just like Vada. Yes he was my hello as well. listening on WCKY off each game I always had plans when I got 16 to drive 300 miles to watch the Reds play. By the time I reached 16 and could drive, the Reds had traded Vada and I did not go although John Bench was the Rookie of the year at that time. I have a ball card my son found for me of Vada. After Vada left I followed Pete Rose but it was not the same as when Vada Pinson was with the Reds. Robinson left in 1971 and Baltimore won the world series. I missed seeing him and Vada in the outfield together. But the Reds went on with Lee May, Concipsion, Bench, Helms, Rose, Seiver, Pappus, Gullet,P. O’Neal, Morgan, and all the great players that played for Sparky Anderson. They were the team of the decade. THE BIG RED MACHINE…. Wish Vada could have been a part it. Vada came to St. Paschals Catholic grammar school in Oakland in the early 1970s to share his baseball insights with the kids. His children went to school there. His daughter Valerie was in my class. I’ll never forget being able to play catch with a major league baseball player! I was also in class with Mr. Pinson’s daughter ( voted “prettiest” in our 8th grade graduating class!). I remember thinking that Mrs. Pinson was the most beautiful mom I’d ever seen! I hope that all the comments and articles bring some pride and happiness to the Pinson family in knowing that Mr. Pinson is so fondly remembered as a great person and a great baseball player. Great tributes to one of the best players of my youthful memories. I have a memory that sticks with me – watching black & white TV baseball about 1960, a player is being intentionally walked, he jumps out and hits one of those pitches into the bleachers for a home run! My memory has always been that it was Vada Pinson. Am I correct? My first memory in life was during a Reds game at Crosley Field sitting down the right field line. The sound of the Red fans pounding their feet in unison on the metal stands made a deafening sound that was both scary and exciting to this 5 year old. So fifty years later with the help of the Internet I wanted to piece my young memories together what actually happened during that magical 1961 pennant-winning season. Cincinnati fans really did’ ‘ Rally Around the Redlegs ‘ during the 61 season getting solid pitching from Joey Jay, Bob Purkey and Jim O’Toole. The Reds got power hitting from Gordy Coleman, Gene Freese and Wally Post smashing 72 homers between them. Frank Robinson was the National League MVP hitting .323 with 37 HR’s and Fred Hutchinson was truly in charge. With all these Redlegs having great years it never would have happened without my childhood hero #28 Vada Pinson. I wanted to be like Vada in every way writing #28 on my T-shirt and imitating his batting ritual getting into the batters box. Even though I was a natural right-hander I would bat left-hander like Vada in back yard pickup games in my Mt. Washington neighborhood. My father would hit me super high fly balls with his tennis racquet, which I would catch with my right-handed mitt on the other hand just to be like Pinson. Taking a closer look of Pinson’s 61 season and his career with the Reds I can see why he was my favorite player. In 61 Vada batted .343 with 23 stolen bases and lead the National League in hits with 208 in only 154 games and won a Gold Glove in centerfield. He had four 200 hit seasons between 1959 and 1965 all this before expansion against future Hall of Famers like Juan Marichal and Sandy Koufax . He was the fastest player from home to first base in all of baseball his shinning shoes just a blur has he ran down the line. Frank Robinson his classmate from McClymonds High School in Oakland Ca. was the stronger player who gained Hall of Fame status winning MVP’s in both leagues. The Big Red Machine with all their great players will always be remembered has one of the greatest teams ever. That being said, to me it all started fifty years ago in the pennant winners of 1961 with the forgotten Redleg centerfield Vada Pinson floating up the terrace running down a Willie Mays drive to right centerfield. . Pinson died in 1995 in his hometown of Oakland Ca. Vada Pinson: even though a Yankee fan, I loved watching Vada roam the terrace in Cincy. He ran with grace and had effortless speed. And he could hit. But unlike man y “stars” who had great games in blowouts – Vada could and would hit in the clutch. Young ballplayers should use him as a model. AND HE WAS “CLEAN”!!!! I have created a page for my father on Facebook Vada Pinson Jr. Hall of Fame. To Vada Pinson III: If you get a chance please post a link to that site … I’d love to see it. I grew up a Cubs fan but I really admired the way that your dad played the game. When the Reds were in town I’d see the man play on TV against my team and think, “God, I wish he was a Cub!! !” Then man was a guy with class and a great player. @ Gary if you have a facebook page just go to Vada Pinson III or Vada Pinson Jr. Hall of Fame and request to get in and I will put you into his group and thanks for being a fan of my dads. I have been trying for some time now to collect baseball cards from the late 50’s. At that time I was just 8yrs-10yrs old. Although American League players get most of my attention, Vada Pinson is a player I remember well and I continue to remain perplexed that he isn’t in the HOF. He had skills and abilities that other players did not have. His career numbers are reflective of this – I have his 1958 topps card and it is one of my favorites. I met Vada while he was the Tigers batting coach. He called the company I worked for to have his apartment filled with furniture for the season. He would leave us comp tickets whenever we wanted. as often repeated he was a real nice guy. we would talk on the phone about other things besides baseball, including each others family. he did on one occasion break character. in about 1987 during a Tigers – A’s game, he was ejected from the game for arguing the scoring of a hit given to alfonzo griffin. he thought it should have been scored an error. the next day I asked what he said, ” I said nothing, nothing” I believe he was a bit embarrassed over the situation. that was the exception not the rule for Vada. he was passionate about the game and human. he wanted to be a big league manager, I wish he could have been recognized for that accomplishment. My name is Vada Pinson III I started a page for my father on facebook book its called The Original Vada Pinson- Hall of Group if you would like to join. I grew up an hour or so east of Pittsburgh and was a Pirates fan, watching Clemente, Alou and Stargell roaming the ivy-covered walls of spacious Forbes Field. Pirates-at-Cincy games always were on the TV (free, what a concept!) from wonderfully quirky Crosley Field. Vada Pinson with the archrival Reds was one of my favorite players. Great speed, great hustle, great sportsmanship. His head was always in the game. That’s why he was such a great player and a great coach. He should have been a manager, too. I grew up in Indiana and have been a huge Reds fan my entire life. Vada Pinson is my all time favorite Red. Pete Rose and Johnny Bench are the easy picks but Vada was so special. He didn’t wear a batting helmit back in the day….he wore a special protective sleeve that his hat went over instead….never saw another player use one….he was the best!!! Vada Pinson was my first and biggest hero as a child. Even though I’m in my 50s now I still consider him my hero. My most cherished possession is my Spalding Vada Pinson glove that i used for years. My second most cherished possession is my wedding gift from my wife. She, with help from my brother, acquired every baseball card for Vada and had them framed (double sided so you can read the backs) with the USA article by Tony Snow, detailing his admiration of Vada shortly after his death, I met Vada, briefly, in 1969 at Spring Training and he was extremely gracious to an awestruck 10 year old. I still play in a 30 and older baseball league and proudly wear #28. After finding this page I’m just happy that there are more people out there that appreciate the worlds most unknown superstar. @Bob Wernke – Norm Cash wore the same type of shield. its really to bad that all of these stories are untrue . I started a page about my father on facebook check it out. WOW it is too bad that stories told from a time before you were born, you take all as not true. I guarantee my posting is true. take a moment and enjoy how your father touched the lives of others. @ Jeff I am the best source for my fathers career I was born in 1963 and my mother was with him throughout his career , I go to her mostly to confirm most of the stories on here, And I have taken the time to enjoy my father career more than you will ever know. Great Reds players. I always liked for him to come to the plate in a clutch situation because you knew something exciting would happen. I always thought it was interesting that he appeared not to wear a batting helmet. Such an exciting player. Sorry to hear about his passing. Like so many other kids in the 60s Vada was my hero. It really bothers me that the Reds have not honored him by retiring his #28 and hanging in on the wall. He belongs there. I, too, grew up watching Vada roam center field at old Crosley Field. Vada was a superb athlete and a gracious human being. The Reds DO need to retire his number #28! Vada was a mans man of baseball. Some of the passion for baseball I carry with me to today is attributable to the style and grace personified by Vada Edward Pinson. My earliest images of major league baseball include Vada roaming center field in Crosley Field, making shoestring catches and scorching lines drives to all fields. The guy could flat out fly. I also was fortunate enough to see Vada play several games when I was growing up in the Cincy area in the late 50s and early 60s. I can still see Vada chasing down a deep fly running up the terrace in my mind’s eye, or beating out an infield hit. Probably the most underrated player of his day and a true HOF’er in my opinion. The “experts’ keep forgetting the incredible overall abilities he had in the field, at bat and on the basepaths. Well wishes to the family. This is my second post. Disappointing there have been but 2 posts since my first in November. There is no question Pinson’s initial 7 seasons rank among the best of anyone’s from 1950-1975 but his stats began to steadily decline in his late 20s, as did his odds for the Hall. His diminished stats without having endured any publicized significant injuries represent a paradox as did the death of this beautiful specimen of a ballplayer at the age of 58. Though Vada was not a Hall of Famer, he was a gifted, graceful athlete and by all the accounts of his piers, a credit to his race…….the human race. Anyone care to share memories of Jim O’Toole or Billy McCool? Vada Pinson was my hero growing up. I can’t tell you hoe many fights I got into with my friends at school when I dared to say he was every bit as good and maybe better than wilie Mays. He deserves to be in the Hall of Fame. when he was a batting coach with the Tigers Skeeter Barnes got me his autograph on a Post Cereal baseball card. It remains one of my most prized posessions. I was in 6th grade in central ky ,a kid in love with Reds .Though I never saw Crosle Field I listened to most every game and kept score at my kitchen table.The lineup was Tommy Harper Vada Pinson Frank Robinson Big Klu Pete Rose Johnny Edwards Jim Maloney .what an outfield I never outgrew those guys.Pinson was my favorite and thst never changed ,not even in 75&76 with the big red machine.Thanks guys! Pinson’s skills during the first 8 years were HOF worthy though he was just shy of being a Hall of Famer over the long hall. Diminshed production, lots of bouncing around on bad AL teams over the last 6 years of his career squandered his chances but not the brilliance of his prime. For those of us who were fans then and now, wouldn’t you agree that both physically and statistically, Vada reminds one or Tori Hunter? Hunter makes $8,000,000 a year. Pinson likely peaked around $60,000! How does noe reconcile that a perfect specimen like Vada who never smoked or drank, died of a stroke at 58? Vada Pinson was a HOF player and a HOF person. I grew up a huge fan even though by then he was nearing the end of his career (71 Indians). Fabulous player who gets lost in the shuffle of so many stars in the 60s. I keep hope alive that the HOF will someday come calling. Did you know that Vada Pinson is the only MLB player to have more than one season with 20 HR’s, 200 hits, and 20 stolen bases. And he did it three times! Such a great man! Would like to talk to his son. He came to speak to young people and delivered such a powerful message. Loved his children. A great ball player. Veda came to mind tonight and the search led to your blog. I am a 58 y/o Cincinnatian. We didn’t get to go to many games but enough that I saw a few at Crosley. Pinson, Maloney, Edwards, Abernathy, Rose, Robinson and the rest were the BRM before the BRM! Around that time, I had a T shirt-28 Vada Pinson which I loved to wear to D league practice and it was such a favorite, I think it is still in a box of things cleaned out from my parents house. Good to know people are still thinking about him as I always do when I see #28. Go to baseball reference.com and check out Vada’s first 8 seasons.